good lord, do i even want to get into this month? no. no i don't. i don't even think this post deserves the spending frost photo. it was rough. it pained me to even type this up. and april is vegas so maybe i need to extend my spending freeze through all of 2015, since i clearly don't have a handle on things yet. -$24 vegas guide book for john, mostly on where to eat. the boys really wanted one, since they've never been. -$60 buffalo wild wings. house hunted with john today, it was our lunch out. plus leftovers for dinner and beers. my treat since he also helped me run a blog errand. -$25 gym membership at my office building. it's actually just a one time refundable $25, so yeah, i don't think you can get a gym membership cheaper than free. i get my $25 back whenever i stop using the gym and return the swipe key. thankfully it was a good month for blog income. it's not always (never) that high. just trying to be completely transparent with the spending recap! and it was nice timing to offset the cost of the yearly vet visit. hawkeye got a clean bill of health and was told she's a perfect weight, in case you're wondering. yes the taco bell eating dog is the picture of health. i'm just as surprised as you. to be honest, there's quite a few things that i would consider necessary spending - the bridal shower gift, treating my friends for their birthdays (which they both do for me every year), the cleaning service, anything for hawkeye. as for the rest? i don't even know. no, we do not need 2 am tacos and to be taking cabs to 4 different bars in 1 night. way way way too much spending in march. whomp whomp. here's to zero spending in april until i get to vegas on the 22nd. Your blog income is ON POINT babe! Hard work pays off, right?! I spent eleventy billion dollars in March. OUCH. Hurrah for elevated blog income to cover you this month! That rocks. Hawkeye, you keep being you and eating your Taco Bell. You are killing it with the blog income! Thanks! They seemed to have all paid out at the same time, so next month will be slim, but I'm okay with it! Any income is a bonus in my book. Thanks Rach! It definitely did this month, I was thrilled. Especially with all the spending I did, yikes. But birthday month. Treat yo self! thank goodness for that income, or it would have been really bad. haha Hawkeye says "oh. I will." It was a very good month! It'll be much slimmer in the coming months but hey, at least it made up for this month's spending. I'll be leaving Vegas when you get there! After Vegas, my budget needs to get in control too. At least you still come out ahead! Seriously with the blogging income insanity this month! wow, you did pretty good! and good job with the blog income!! that's amazing! Oh my gosh, Collective Bias gets you that much?! I need to get on that boat. I'm going to Vegas next week. But late night tacos are so so worth it!! And a free gym membership? That's awesome! 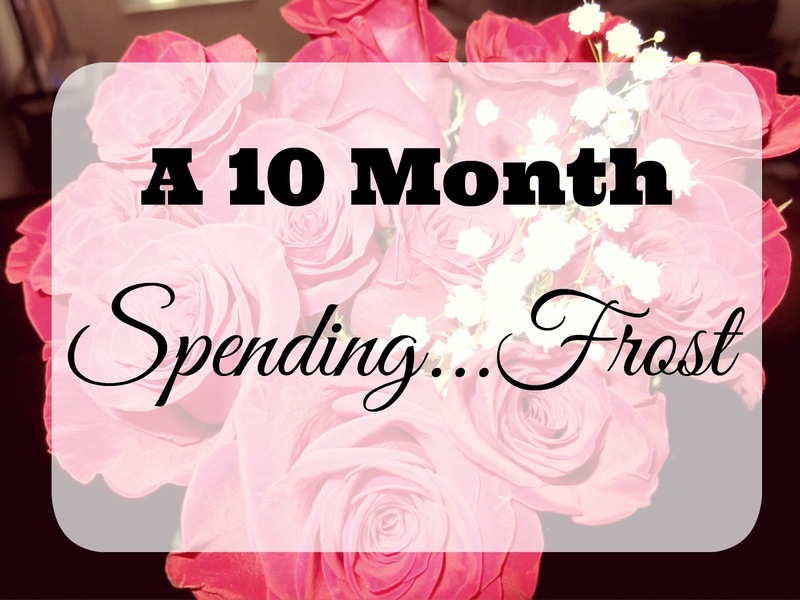 I'm on a spending freeze too! I can buy two things. A strapless bra and wedding stuff. That's it. We're going to Dallas the middle of this month and I have money put back for it. But other than that...nothing will be spent. It's hard. Seriously? $100 just from swag bucks? I've started letting the videos play through when I'm not using my phone, but I am no where near being able to redeem anything. At least the blogging income offset the expenses and you still ended in the black. And hooray for lower vet bills! I would say you ended the month on a positive because all that blog income has offset the spending! And yay for Hawkeye! I wish my doctor told me I was the perfect weight! What about groceries? Shouldn't those be considered a necessary expense since you need to eat to live? That's awesome that you got so much from the blog! I love the way your gym membership works! That's super awesome! My major reason not to join a gym is the cost. March always seems to be a bad month when it comes to spending for me. At least you came out in the green at the end! At least you were still to the good. So it all works out. I'm jealous of the gym membership. I refuse to pay what places here charge. I know I will just skip going and quit anyway. I know! It all came in at once, because they pay on different cycles (immediately as opposed to 60 day waits.) So next month will be only like 1 thing but that's fine, since this was clearly the month I needed the help! Thanks! It will go down in history as my best month haha. But it was good timing, so I'm happy. Indeed. Collective Bias was the campaign I worked on to help promote HP and Meghan Trainor's tour. They were great to work with, definitely hop on board! I know, they tasted so good so I can't complain to much. Yes, free! It's not as fancy as a lifetime fitness or anything but they have a good space, a bunch of bikes, treadmills, and ellipticals, and all the usual free weights. So no fancy pools or trainers or saunas, but I don't use those anyway so I'm happy! Haha that's a good point, they were delicious. We went to Lazos near me, Western and Armitage. Delicious. Why is finding a good strapless bra such a struggle? Let me know if you find something successful! Good luck! That wedding spending sure does add up. Yep, I make $100 every month! I have a couple tutorials on what I do if you look under the Finances category under the lifestyle tab, or just search Swagbucks in the search box. I'll have another one soon too. Thank goodness for blog income. I was definitely thrilled at the lower vet bill, but it was because I got her 3 and 5 year versions of shots last year so when those come around again... ouch. Thank goodness I didn't end up in the red. Definitely would have if it weren't for blog income. That's true, they are necessary. But I do think I could have gotten that price lower had I really planned out my meals and gone into the store to use coupons. Convenience won out this time. Blog income was so good this month, thankfully! I was surprised, I don't usually think of March as a big spending month for me. But boy did I spend. Thankfully not into the red, but darn close. I would never pay regular gym membership prices. I did in college, or at least my mom paid it for me, and I never went. I used my locker there to store my backpack when I went out to the bars straight after class. Never set foot on a machine. Whomp. Wow! I'm impressed! I don't keep track that well, and I haven't tried for any blog income lately on top of that. You go girl! i agree with what you consider necessary.. i mean, am i gonna show up to the shower without a gift? lol. march was beyond horrible for me, like really, really bad.. so much shopping, and none of it necessary. oops. love your honesty though! Im still always impressed that you are able to track dollar for dollar. You do awesome most months so I dont think its that bad that there were 2 am tacos after you go out this month. March was TERRIBLE for me an spending so lets just say you did a LOT better than I did. I use YNAB budgeting software so I track every penny coming in or out. It saves my sanity. Thankfully the blog income helped so much this month! Right? I suppose I could have declined the shower invite, but even then I still feel like I should send a gift. March was painful. April is already becoming painful, I need to rein it in. I'm not tracking in vegas though. Just taking out cash and calling it a day. YNAB software saves me. Otherwise I would never check my finances, but the app nudges me daily if I haven't tracked yet, so it's helpful! I really needed those tacos at the time haha. Probably I would have been sick if I didn't get them, so maybe it was a fair trade!